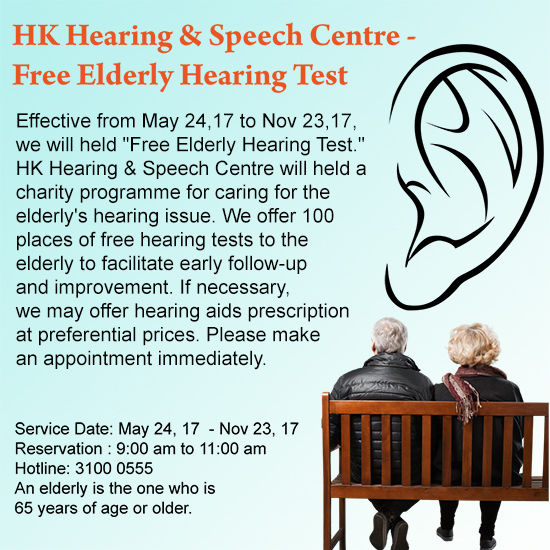 Due to the high response of the free elderly hearing test offered by us from February 18 to March 31 last year and a free charity programme joinly organised by us and the Kin Lok Club, the Nasopharyngeal carcinoma mutual aid organization, to the patients with hearing issues from June 20 to August 30 last year, HK Hearing & Speech Centre will held a Free Elderly Hearing Test for 6 months with 100 places in the purpose of benefit more elderly people. If necessary, we may offer hearing aid prescription at preferential prices. Please make an appointment immediately. An elderly is the one who is 65 years of age or older.